The sandbox is where millions of childhood memories are made. Nothing beats sifting through the sand, creating castles and forts a child’s imaginative characters live in or digging through sand for buried treasure. BE Good Sandbox Critter sandbox play sets allows one to bring the fun and adventure of the sandbox inside. As a new stay at home dad, Founder and President Vince Kurr was looking for something to do with his 4-year-old daughter despite the rain preventing them from playing outside. The sandbox play set idea was born, and it allowed Vince and his daughter to play all day long, rain or shine. 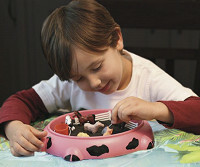 The backyard sandbox fun is brought onto the tabletop with this unique, tactile little Sandbox Critter sandbox play set. It’s loaded with adventure tools, a no mess play mat and a no leak lid. It is designed for hours of creative, imaginative fun, as well as the educational value of developing fine motor skills. Rain or shine, the amusement and adventure of sandbox fun never ends with the Sandbox Critter. These fun sandbox play sets are available in several different animal sets ranging from a ladybug to dinosaur to appeal to all imaginative minds! The sandbox is where millions of childhood memories are made. Nothing beats sifting through the sand, creating castles and forts a child’s imaginative characters live in or digging through sand for buried treasure. BE Good Sandbox Critter sandbox play sets allows one to bring the fun and adventure of the sandbox inside. As a new stay at home dad, Founder and President Vince Kurr was looking for something to do with his 4-year-old daughter despite the rain preventing them from playing outside. The sandbox play set idea was born, and it allowed Vince and his daughter to play all day long, rain or shine. 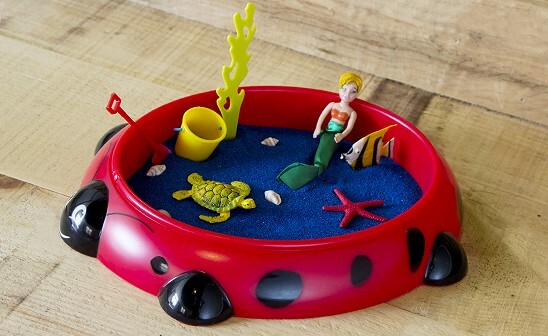 The backyard sandbox fun is brought onto the tabletop with this unique, tactile little Sandbox Critter sandbox play set. It’s loaded with adventure tools, a no mess play mat and a no leak lid. It is designed for hours of creative, imaginative fun, as well as the educational value of developing fine motor skills.